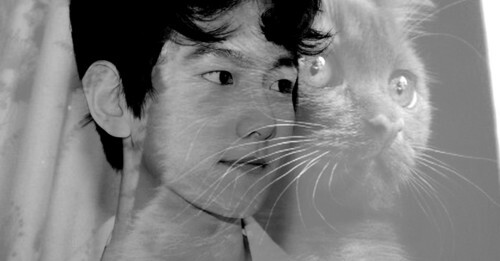 “Bacon?” Chanyeol pushed the door to his bathroom open, peaking around at the floor to see where his cat had gone. His eyes quickly scanned the floor for the cute, brown kitten, expecting to see him jumping up and down at the window excitedly; except Chanyeol couldn’t see him anywhere. “Bacon? Are you trying to take a shower?” The tall boy chuckled at himself and reached out to pull back the shower curtain, only to shriek in surprise. “YAH!” He stumbled backwards as he took in the sight in front of him. Instead of his cat, standing in his shower was a young man, not much older than himself, stark and blushing from head to toe, covering his manhood with both hands. Chanyeol stared at him with wide eyes. “Before you freak out, let me explain-” The boy lifted one of his hands and raised it out towards Chanyeol in a calming gesture, but Chanyeol was too far gone to listen. “WHAT THE HELL, WHO ARE YOU? WHAT ARE YOU DOING IN MY SHOWER? WHY ARE YOU ! HELP! ! HEEELP!” He started flailing his arms and running around the bathroom to look for something to smack his intruder with.